Artist Patterson Clark makes ink and other materials from the invasive plants he gathers for the US National Park Service. We do not usually think of plants as destructive. But some plants are exactly that. By definition, invasive plants are not native to an area. They can grow and spread quickly, often harming or killing other plant life. Invasive plants can damage and even destroy ecosystems. This sometimes happens because the plant and animal species that keep them under control are no longer present in an area. Patterson Clark has worked as a volunteer for the United States National Park Service for almost 15 years. He goes through forests, and removes non-native plants. He knows how harmful these weeds can be. They can kill trees, increase soil loss, and cause major damage to waterways and wetland areas. Clark had developed an unfriendly relationship with invasive plants. But then he decided something needed to change. “One day, when I was pulling a plant, I thought, how can I change my relationship with this plant so that it’s not just eradication, taking something's life? Since then, I’ve been harvesting invasive plants, rather than just killing them." Some people who volunteer to pull weeds are called warriors. Yet Clark says he doesn't consider himself a warrior. And now Clark, who is an artist, gives these plants a new life – as art work. “When I first work with a plant, I call that prospecting. I’ll sit with the plant, study its nature, cut it, bring it back into the studio and then start running tests." He begins to test the plant to see it can produce color or paper or other materials. Over the years, Clark has developed a liking for some invasive plants, like the white mulberry tree. “I like white mulberry. It offers paper, the strongest, whitest paper." The paper-making process takes long hours of work, and a lot of patience. Clark estimates it takes 20 minutes to cut down the plant, 30 minutes to steam it and five minutes to remove the outer covering. Then, it takes three hours to scrape it, an hour more to cook it, 20 minutes to wash it and another hour to beat it. After all of that work is done, he flattens the mulberry sheets and lets them dry overnight. The result is pieces of paper that will become art. Clark also gets the ink coloring for his paintings and prints from invasive plants. For example, he takes leaves from ivy plants and puts them in alcohol to make green ink. For red ink, he uses multiflora rose. The inner bark of bush honeysuckle gives him aqua blue. And the bark of leatherleaf mahonia offers bright yellow. A Patterson Clark print on White Mulberry paper made with pigments from Multiflora Rose, Irish Ivy, Amur Honeysuckle, Leatherleaf Mahonia and weed soot. 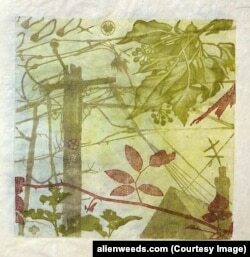 Each print that Clark creates includes images of all of the plants he has collected. Sometimes, the images show a volunteer pulling plants or a tool used to process the plants. First, Clark creates digital designs of his art on the computer. Then, he cuts his design into a block of wood by laser. Next, he places the ink onto the block and presses it onto the paper. He repeats the process for each color. Clark shows the prints and paintings in art exhibits. “I do appreciate the compliments but one thing I have heard some concern about is the archival quality of these prints." He says some of the plant-based coloring will last for a long time, but the brighter colors do not last as long if they come in contact with bright light. So, he suggests that people keep his prints in low light or in a protective covering. With his artistic treatment of invasive plants, Patterson Clark is turning these unpopular plants into something valuable. Faiza Elmasry reported this story for VOANews.com. Alice Bryant adapted her report for Learning English. George Grow was the editor.